What once was Little Hell is today bounded by North and Chicago Avenues and Sedgwick and Halsted Streets. Originally settled by German immigrants when it was on the edge of the city in the mid-19th Century, it was a truck-farming community that gradually grew up into an urban neighborhood. When the original German settlers achieved the means to move on to more affluent areas of the city, they were succeeded by Irish immigrants. The Irish moved on, and the neighborhood became Swedish. The area was leveled by the Great Chicago Fire in 1871 and hastily rebuilt, as residents slapped up rude wooden tenements, often two or three to each lot. Around the turn of the century, the Swedes moved out, and the newest immigrant wave, the Sicilians, moved in. The neighborhood the Sicilians inherited was already run-down and became an ominous place for outsiders to enter. Ridden with gangs, including the infamous "Black Hand Society," it echoed so frequently with gunfire that a place near what is now Oak Street and Cleveland Avenue became known as "Death Corner" because of the numerous gang murders that had been committed there. The entire neighborhood got its own nickname, too: "Little Hell District." When World War I broke out, African Americans surged out of the South to most of the nation`s great Northern cities to take jobs in the newly created defense industries. In Chicago, the black population leaped dramatically from 30,000 in 1900 to 110,000 in 1920. Pent up on the South Side, by 1940, African Americans were slowly beginning to break out of their restricted neighborhoods to other parts of the city. They were, however, allowed to move only to the most dilapidated neighborhoods, from one slum to another. One place they began to show up was Little Hell, where in 1940, African Americans made up 20 percent of the population. The city was not blind to the conditions of Little Hell. 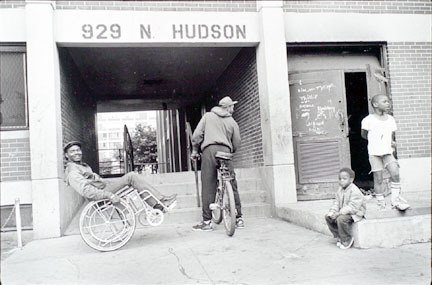 In 1937 the Chicago Housing Authority was created to begin dealing with the city`s slum problems. Three days before the Japanese attack on Pearl Harbor in December of 1941, the CHA broke ground on one of its first housing projects right in the middle of Little Hell, building 586 two- and three-story townhouse units. Determined to make the new project a model of nondiscrimination and integration, the CHA opened it in August of 1942 to 75 percent white families and 25 percent black. The homes were small and spartan, but they were clean and modern, an oasis amid the squalor of the rest of the neighborhood. The project was named after Frances Cabrini, the first American-born saint. Initially the Frances Cabrini Homes had a “quota” of African American residents. That quota was abandoned as the African American population in Chicago nearly doubled in size between 1940 and 1950 and because white Chicagoans remained adamantly opposed to integrated housing in their neighborhoods. With the passage of the 1949 Housing Act which approved another wave of slum clearance and new public housing construction, the Cabrini Extension, a high rise of 1,921 units was authorized. That project was completed in 1958, followed by the nearby William Green Homes, another high rise building (1,099 units) which was opened in 1962. 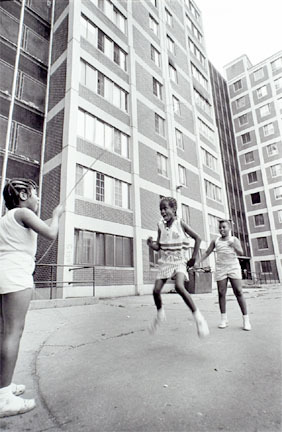 All three projects became known as Cabrini-Green, and were the first example of high-rise public housing primarily for the African American poor in Chicago. 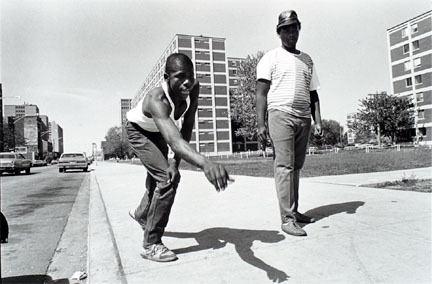 By 1968 public housing through the city of Chicago was predominantly African American. With high crime and unemployment Cabrini Green, along with other housing projects in the city, came to symbolize the failure of city government in Chicago (and across the nation) to resolve the problems of the concentrated and isolated urban African American poor. 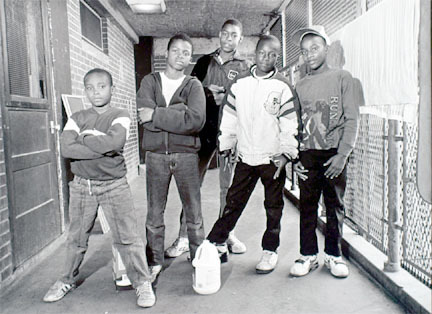 Oct. 13, 1992: Shortly after the 9 a.m. school bell, 7-year-old Dantrell Davis is shot in the head by a sniper while walking with his mother from his Cabrini-Green high-rise to the Jenner Academy of the Arts. Half an hour later, he is pronounced dead at Children's Memorial Hospital. Later that day, police arrest reputed street gang leader Anthony Garrett, 33, in connection with Dantrell's murder. Oct. 14, 1992: Police charge Garrett with firing an AR-15 semiautomatic rifle from 10th-floor window of a building at 1157-59 N. Cleveland Ave. and hitting Dantrell Davis in the head. Police said Garrett, an Army veteran confessed in a signed, 51/2-page confession that he was aiming at members of a rival street gang. Oct. 17, 1992: Dantrell Davis, wearing a small tuxedo, is buried in a blue casket at Space 13, Row 7 of the Washington Memory Gardens Cemetery in Homewood. Oct. 19, 1992: Garrett's attorney, Raymond L. Prusak, accuses police of intimidating Garrett by repeated beatings until he would confess. Nov. 5, 1992: Garrett is indicted on first-degree murder charges in the fatal shooting of Dantrell Davis. Jan. 12, 1993: Chicago City Council passes an ordinance designating North Cleveland Avenue, between West Oak Street and West Hobbie Street, as Dantrell Davis Way. March 5, 1993: Dantrell Davis Way sign is hung on North Cleveland Avenue. Local politicians and celebrities meet to discuss Dantrell's murder in the Jenner school's auditorium that afternoon. Feb. 1, 1994: Garrett's trial begins with a two-woman, 10-man panel of jurors. Feb. 8, 1994: The jury finds Garrett guilty of Dantrell Davis' murder. March 8, 1994: Cook County Circuit Judge Earl Strayhorn sentences Garrett to 100 years in prison for Dantrell Davis' murder. When Lynn began singing "It's So Hard to Say Goodbye to Yesterday," many of the children and other mourners wept, drowning out the lyrics being sung in tribute to Dantrell. 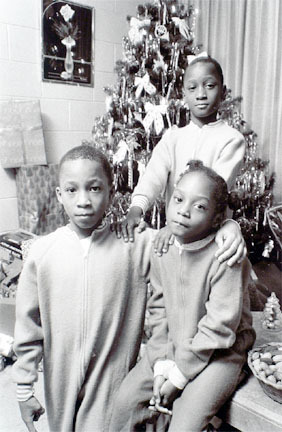 March 5, 1993 [Chicago] Attorneys for the mother of Dantrell Davis said Thursday that they will challenge the constitutionality of a new state law regarding public housing evictions in their quest to keep the woman from being tossed out of her apartment by the Chicago Housing Authority. The CHA started eviction proceedings after Annette Freeman was arrested in December on charges of possessing crack cocaine. The case was later dropped. Dantrell, Freeman's 7-year-old son, was fatally shot by a sniper last October as he walked to school near the Cabrini-Green housing complex. Attorneys for the Legal Assistance Foundation of Chicago said they want a 2-month-old law that requires expedited eviction hearings for public housing residents declared unconstitutional because it unfairly penalizes public housing residents, most of whom are black. In 1974, when he was 22, Stone and his best friend, Norman Gibson, were playing basketball at a court on Sedgwick when a limousine pulled up. "This black guy, Michael Schultz, got out," said Stone. "He said, 'How would you like to be in a movie?' 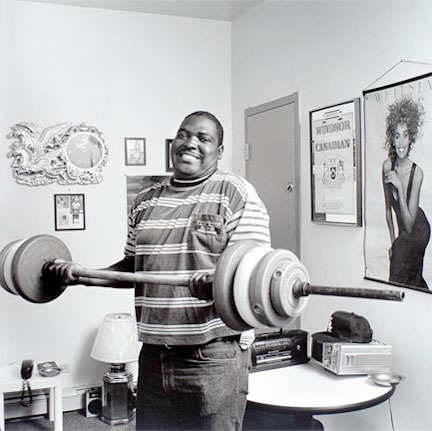 He was in town making Cooley High, and they were looking for tough guys from out of Cabrini. They had other people from Cabrini in that movie--Jackie Taylor and Maurice Havis. Me and Norman went to the audition. We said, 'Let's go. If we don't get the part, we can stick them up.'" Neither he nor Gibson had any acting experience, but they got parts. They played a couple of toughs and had several scenes--playing craps, stealing a car, beating up the protagonist because they think he ratted on them to the police. "We were stars in Cabrini after that," Stone said, "but I didn't follow up with acting." Within a year, Gibson was dead. "He got shot at a crap game," said Stone. In 1978 Stone was sent to prison. "I got eight years for 'strong-armed' robbery," he said. "They wrote about it in Jet magazine. 'Star of Cooley High doing time.' I read it in the joint." In about two weeks, Tamekia Murry will be forced to say goodbye to her childhood neighborhood and her home in the Frances Cabrini Rowhouses. "I'm lost for words," Murry, 25, said one recent afternoon as she strolled with her 2-year-old son down a deserted street of boarded-up apartments. "It's gonna be hard." The row houses, nestled next to Chicago's dynamic downtown, are all that survive of what was once one of the world's most famous public housing complexes. Now 440 row house units that haven't been remodeled are being closed. Murry's family, along with the 18 other families who remained in unimproved units, will have to move. And the fate of these low-rise brick apartments, which once buzzed with life and hope, is up for grabs. For developers, the land that was once Cabrini-Green is rich with promise, a tasty piece of steak. For nearby locals, the row houses are reminders of a poorer past, the last spots of dirt to wash away from the neighborhood. But for the remaining Cabrini-Green residents, who have long called this neighborhood home, the boarded-up windows and metal fences going up around some of the row houses represent yet another broken promise. "It's a classic bait-and-switch," said Richard Wheelock, director of advocacy for the Legal Assistance Foundation of Metropolitan Chicago, which represents families who lived in Cabrini-Green when the complex was slated for demolition in 1999. Since that time, all of Cabrini's high-rises have been demolished — the last one came down in 2011 — and the neighborhood has steadily improved under the Chicago Housing Authority's $1.6 billion, 12-year-old Plan for Transformation. Parkside of Old Town is a multi-unit, 18 acre mixed-income housing development on Division Street. The plan is to provide more than 700 homes on Chicago’s near North Side, on the ground of the infamous Cabrini-Green housing project. The development, being built in several phases, is funded with a combination of private and public money — using tax increment financing, federal housing money and loans from J.P. Morgan Chase. CHICAGO – Deborah Hope doesn’t feel at home in her $300,000 apartment. But deeper than that happiness, there’s emptiness in Hope. Security doesn’t quell her feelings of isolation in a drastically different neighborhood. She gets on the elevator and expects no greeting from neighbors. Apartment staff checks up on her to make sure she’s keeping her apartment clean. It makes her nervous. Hope doesn’t invite friends over for barbeques because she thinks the noise will get her in trouble. She begins to cry when discussing the darkest part of mixed-income housing.